We asked bartenders about their best selling mezcal. They said, in their droves, del maguey. We could have guessed – del maguey was the overall bartender’s choice in 2015 and second in 2016. Ron cooper’s brand is no longer niche – it has responded to the bartender clamour with an ever-growing distribution. Well over half the bars that took part in this poll said it was their best selling mezcal. Yet, despite this growth, it retains its values – single estate, sustainable practices, fair wages for farmers. This is a mezcal that delivers what it did all those years ago, although nowadays on time – cooper doesn’t have to rely on fedex. 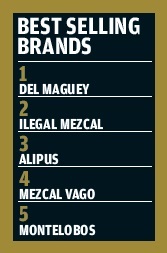 Ilegal mezcal, along with alipus, is well ahead of the other brands in this list. Like del maguey, ilegal mezcal has a compelling story of struggling and smuggling to get its wares to market. No longer do producers struggle – there are now in the region of 400 mezcal brands in existence. 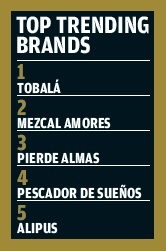 Still, expect del maguey to dominate this list for some time.